Today I was lucky enough to bump into Karen and Charlotte, two medic students living in Copenhagen. When they're not studying (hard) they like to come and chill in the beautiful park, Kongens Have. Lovin' Karen's cool ladylike look. 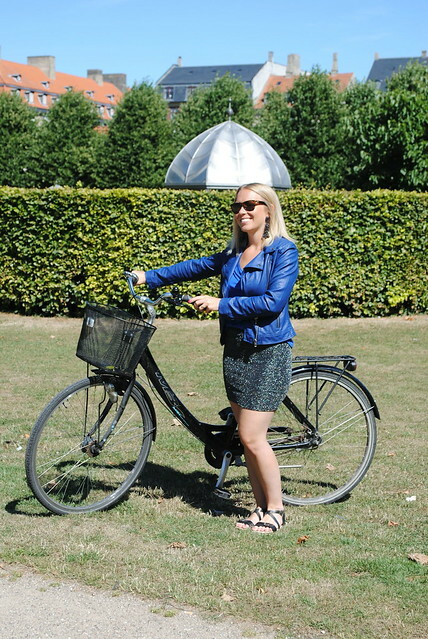 Charlotte teams her sparkly black skirt with that gorgeous blue leather jacket. Girls cycling around the city in the awesome sunshine! Time for a quick cuddle near Store Kongensgade. Oi oi, what's going on here? Cheeky grab from Charlotte. Thank you to the beautiful ladies Karen and Charlotte for taking the time out for a quick pose as well as huge congratulations to Charlotte on her recent engagement! Tillykke!